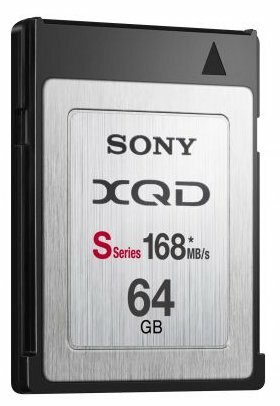 Sony shows off its new XQD S, a new memory card series that promises read and write speeds of up to 168MB/s. The company says XQD S is ideal for sports photographers, the high data transfer speed enables you to capture 108 RAW frames in a single non-stop burst. This means you can capture a 100 meter sprint from start to finish in a single burst in RAW with a capture speed of ten frames per second. A 64GB XQD S card will ship later this month, a 32GB version will follow in October.